You could even Wrap these Free LED Softstix Tubes around your passengers ankles for a Unique glowing effect! Free Bendable LED Light Tubes! As part of our LED line, LED SoftStix tubes have an intense glow, but can also be bent into any shape to fit anywhere! SoftStix tubes are unbreakable and can be twisted or bent into any position. They have Chrome endcaps to give a customized look to any vehicle. SoftStix can be plugged into a cigarette lighter adapter or be permanently installed with a simple 2-wire installation. 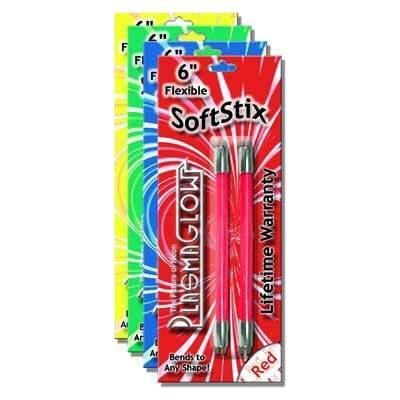 Just like the rest of our LED Line, SoftStix tubes are backed up with the PlasmaGlow Lifetime Warranty. The LED Softstix Tubes come in "Pairs" of three different sizes: 4, 6, and 8 inches. And they are avialiable in 4 Bright colors. $49.99 for a pair of 8" Softstix.